This cake was super dense and sweet. In my opinion, there was way too much frosting. If I were going to make this again, I would reduce the sugar by 1/2 cup, reduce the oil by 1/2 cup and reduce the frosting recipe by at least half. 1. Let eggs stand at room temperature 30 minutes. Preheat oven to 350 degrees F. Grease three 9-inch round cake pans. Line bottoms with waxed or parchment paper. Grease and flour paper; set aside. 2. In bowl combine flour, sugar, baking powder, salt, and cloves. Stir in bananas, oil, eggs, and vanilla until moist and thick. Stir in sweet potatoes and pineapple. Spread evenly in prepared pans. 3. Bake 30 minutes or until pick inserted near centers comes out clean. Cool in pans on wire racks 10 minutes. Remove from pans. Peel off paper. Cool completely. 4. Prepare Caramel Butter Frosting. Place one layer, flat side up, on plate. Spread top only with 1-1/4 cups frosting. Stack and frost remaining layers. Makes 16 servings. 5. 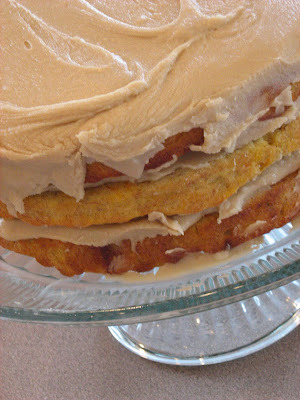 Caramel Butter Frosting: In large saucepan melt 1 cup butter; add 2 cups packed brown sugar. Bring to boiling over medium heat; stirring constantly. Cook and stir 1 minute; cool 5 minutes. Whisk in 1/2 cup milk until smooth. Whisk in 6 cups powdered sugar until smooth. Use at once; frosting stiffens as it cools. Makes 4 cups.